Previous Foreclosure Victims are Making Their Comeback! Homeowners who may have lost their homes due to foreclosure or short sale are finding their way back into the market place, thanks to some new lending guidelines. We like to call these buyers “Boomerang Buyers”. Now, when you hear the term ‘boomerang’ your mind may go straight to the child who left home for college and is now moving back after graduation… or maybe it reminds you that you’ve been wanting do dig out the old frisbee and boomerang you have sitting outside in the garage. But today, we’re giving you a new definition of the term. The new definition is exciting and puts hope back into the eyes of individuals or families that unfortunately lost their homes during the economic crisis. We’re ready to help these people become home owners once again! 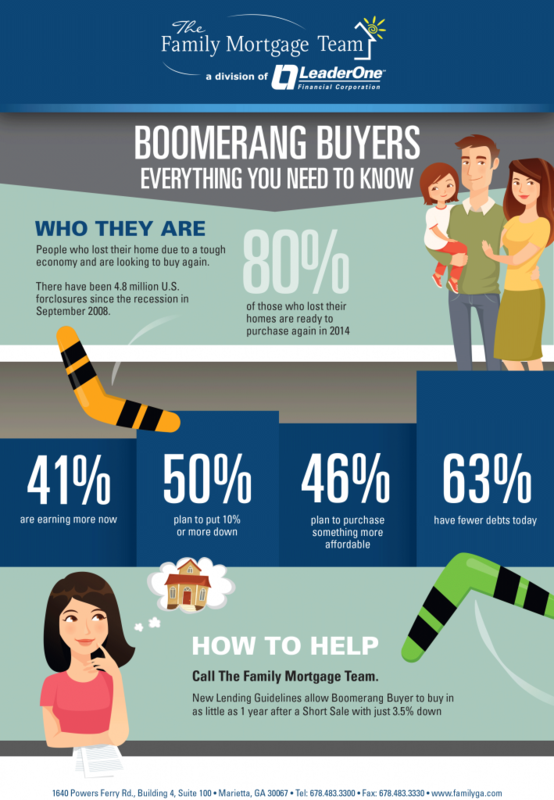 Here’s an infographic that explains just who these Boomerang Buyers are. For more on the new lending guidelines developed to help put you, or someone you know, back into a home you own, take a look at our previous post, Boomerang Buyers- The Next Homebuying Explosion, or give The Family Mortgage Team of Atlanta a call today @ 678-483-3300!